The picture of this month represents an old dream of mine, wich finally came true! 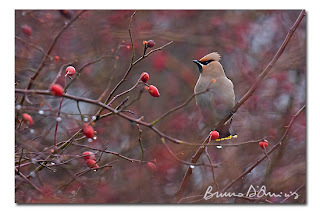 Indeed, since I moved to live in Germany, about three years ago, I've spent countless hours (and driven many kilometers...) every winter, vainly searching for waxwings to photograph. These beautifully coloured birds are irregular winter visitors here in Central Europe, from the breeding grounds in the Northern and Arctic Regions. Every year, many or just a few of these obliging birds spend the winter months in Germany, moving continuosly through the land on the look for berries, their main food. Therefore, it is almost impossible to predict where to find this species and plan a photographic session. Just luck and patience allowed me a close experience with them feeding on some old rose hips in the German countryside. Despite the dim light and the grey sky, I've managed to get some sharp shots of the birds moving hectically around the shrubs, totally oblivious to my presence. Then, after about an hour, as if the spell broke, they suddenly flew all away, disppearing into the fog.